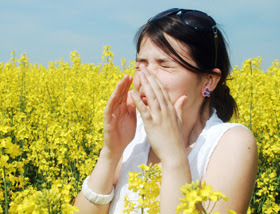 Allergies are due to hypersensitivity of immune system when something you don't like(called allergens) is in environment around you. The symptoms include red eyes, shortness of breath, itchy rashes etc. The types of allergies are rhinitis(hay fever),Conjunctivitis(Pinkeye),asthma, urticaria(skin rashes) and food allergies. There is no permanent cure for allergies, but it could be controlled. Below are some of the foods which could help in reducing sensitivity to allergies. Have fruits which are rich in vitamin C. Vitamin C helps in reducing the allergic chemicals (histamine). Orange,lemon,Kiwi and other citrus fruits are all rich in vitamin C.
Pineapple has bromelain enzyme which helps in reducing allergic irritations. Omega 3 fatty acids such as DHA(docosahexaenoic acid) and EPA(Eicosapentaenoic acid) helps in reducing inflammation which are in fish like tuna, salmon etc. Try to have it once in every week. Honey also helps in increasing the antibodies against allergies if you consume it regularly.